I studied B.Sc. (General) at the Sherubtse College, Kanglung, Bhutan (1994-1997). I have M.Sc. (Wildlife Ecology) from the University of Wisconsin-Madison, the United States of America (2004). In my graduate studies, I worked on habitat modeling and developed ecosystem classification for Bhutan. Using the modeled ecosystem classification as one of the important habitat templates, I produced probable distribution maps for birdlife found in Bhutan, as of 2003. I have a passion for birds, natural history and natural sounds. 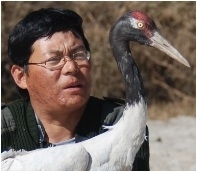 I am currently working on the "transboundary migraation of Grus nigricollis - Black-necked Crane" with Mr. Nawang Norbu (Director, UWICE) and Dr. Martin Wikelski, Max Planck Institute for Ornithology. I look forward to work on big raptors to understand movement mechanisms, and faunal seed dispersal. I aspire to document biodiversity in the Bhutan Himalaya.